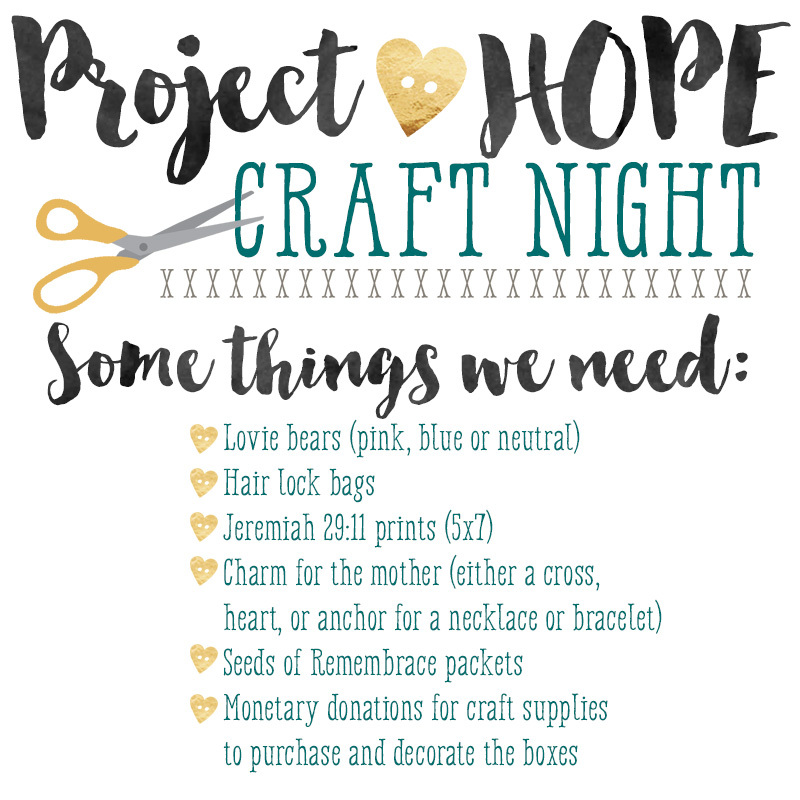 I wanted to hop on and take a second to let y'all know about another Project Hope Craft Night that is in the works. If you have followed my blog for any amount of time, then you know all about Project Hope and how it began. If not, you can click this link to read all about it. In short, after losing our babies, we were given memory boxes in the hospital. When I recieved mine after having Faith, there was a little pink lovie bear inside. I picked it up and instantly felt hope that I would one day have another little girl and give her that lovie bear. It was pink with angel wings and our now nearly 5 year old Mia Glory, carries that bear with her wherever she goes. When Mia was a little baby, I searched out the organization that gave me this memory box and found Threads of Love here in San Antonio. They operate completely off of donations. I decided to put together a day for women to get together and decoroate boxes. We held our first little event in the school caferia of Cornerstone School. We donated 50 decorated boxes to Threads of Love. A year later, I decided we needed to not only decorate and donate the boxes themselves, but fill them with all of the special items. Including lovie bears. 100 of them! I put the word out here on my blog and with the help of so many amazing friends around the world (literally! it was amazing!) We were able to donate and fill 100 memory boxes. The craft night was an amazing night with over 60 women coming together for this cause. Here we are again. It has been a couple years, we planted a church, had a miscarriage and had a new baby, but the dream and passion for Project Hope has never ever died. In fact it is even stronger. I have such a heart for women in those very moments after losing a baby. I always say if I could be there to offer an actual hug, I would. But these boxes are a little bit of that same love. Not just from me, but from women across the world who want to hug these women too. So, I am asking you...to number one, please be in prayer and agreement with me to get 100 boxes filled. A list of the items we need will be below. If you are local to San Antonio, you can also join us for the Craft Night. $5 RSVP will hold your spot. We will have food and giveaways and it will just be a special and fun time together as women sharing one purpose. We only have 100 seats available and are already selling tickets fast so hurry if you'd like to join us!! If you are a handmade shop owner and would be willing to donate items for the giveaways, we would love that! Or if you can handstamp charms to go in the boxes for the mothers, or if you can donate a lovie, or you can even donate moneatrily...we'd so greatly appreciate it. This is a big dream. But I know God is bigger. MySQL is the world's best accepted accessible antecedent relational database administering system. It is broadly acclimated web applications due to fast performance, mysql backup aerial believability and scaliblity, cost-effectiveness. Several able and acute appearance accomplish MySQL the ultimate best for web applications.